Some of my imaginary friends have been asking me if I have had medical training. My incisive advice for the doldrums, warts, and CPS (coach potato syndrome) astounds them. They shake their heads in disbelief when I casually mention that I have self-diagnosed any number of serious medical conditions (coronary toenail disease, flatulence of the brain, and astigmatic kidney syndrome) and spontaneously healed without the aid of so-called medically trained personnel. Now I know exactly what you are thinking: How can such a simple person gain that degree of knowledge and ability? First, I would appreciate it if you would just go ahead and ask me out loud. If we’re going to have any kind of healthy relationship, you can’t expect me to keep reading your mind. My therapist said that’s one of the problems we need to work on. Second, I pride myself on being a simple person (my mother, may she rest in peace, recognized my lack of pretentious thinking early in my life and often called me simple-minded). So you can understand why I believe anyone can attain my level of medical knowledge and insight. Fourth, you must have restraint. Most people do not know how to use search engines correctly. To illustrate, let’s say you type in “health benefits of chocolate.” A list of articles appears, and the majority of the titles declare that chocolate is healthy. Some will mention that it is good for your heart. Others will link it to weight loss. Yes, weight loss. Really. If you don’t believe me, look it up. But let me say this, your need to look it up says a lot about our relationship, doesn’t it? Fourth and three-quarters, we haven’t finished with restraint. Most people lack it. They click on the articles about chocolate and then read them. Don’t do it my friend. Accept what the headline or title says. Nine out of ten articles are what I like to call “motorboat articles.” They rev up the article by stating that chocolate is good for you and then go but, but, but, but, but all the way home. Trust me, all those facts will only confuse you. Fifth, as is my wont, I am developing a revolutionary new medical degree for those who have the necessary qualifications (see the third point). I call it the Medical Advanced Degree (MAD). Sixth, it won’t cost you a thing. I, on the other hand, will spend a lot of time and money on development, advertisements, and shipping. But that won’t matter to you, will it? I am still grieving over your lack of interest in that other scheme. But don’t worry about me and my little bank account. We’ll manage somehow. Seventh, I know exactly what you are thinking right now, and I wish you would stop it. Reading your mind and listening to my imaginary friends all day is driving me mad. Eighth, I recently rediscovered the secret formula of H.H.H., the greatest discovery of the age, or what I call “The Greatest Re-discovery of the Age.” Once I find time in my busy schedule, I plan to make it available on this website. Not that you would buy it because no matter how hard I try, it’s just never good enough for you, is it? But that’s okay because I am totally over it. Really. You may, however, be interested to know that my advertising agency (see picture above) can be found here. I’m adding “MAD” after my name on my resume. It will enhance my medical creds significantly. And this is brilliant: Nine out of ten articles are what I like to call “motorboat articles.” They rev up the article by stating that chocolate is good for you and then go but, but, but, but, but all the way home. I’m glad you liked the motorboat comment. The next time I fill out a form at a medical clinic, I may put those initials after my name. And what is the cure for CPS? Please don’t say “get up and move,” as I may have to cry. See yesterday’s post “The Treatment.” Sadly it involves exercise; happily it involves chocolate. 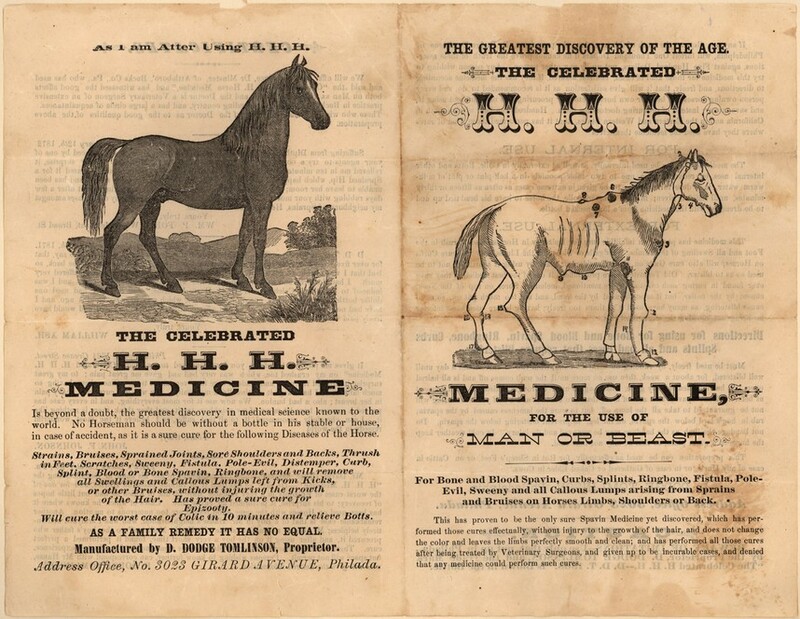 I mistakenly believed that the secret formula for your HHH cure would be useless to me, but then I noticed in the fine print that it not only cures Ringbone, but also the horrors of Epitzooty. Count me in. Where do I send my check? Finally, I will be Epitzooty-free. I admire your courage in admitting you have epitzooty. Do you suffer from ringbone, too? It’s nothing to horse around with. Ok, you are crazy but I love it. We all need imaginery friends! Some days I am crazier than others. My imaginary friends don’t seem to mind. Waaaaiiiittttt- are you calling me imaginary? No, chlost. My imaginary friends don’t have blogs. I wonder if our imaginary friends know each other. What if they talk about us behind our backs? “flatulence of the brain”…I’m quite sure I suffer from this ailment often. I’m very interested in your HHH cure for this debilitating condition. What is your imaginary bank where I can send my imaginary check? River Bank. Perhaps you’ve heard of it. I wish you every success with your latest venture – please put my name down for two bottles of the wonder medicine. I will notify as soon as they are available! I’m quite certain that HHH would help my wounded cankles…. Please put me on the mailing list, and say “hi” to your imaginary friends for me. Cankle cures are often hard to find; HHH is the answer. My imaginary friends said, “Honk,” to you. I’m glad you liked it, Steve. Problem-solving is a lot like question-answering and information-learning. If I grow fabulously rich selling H.H.H., I will fund a study to look into the hyphenated words. This may seem odd, but I think my favorite part of this post is your use of the phrase “as is my wont.” Since Edgar Rice Burroughs will never have a blog, I think this is the only place online where I will be able to find classic phrases like that.I guess I should make clear that I grew up a huge fan of ERB. I’m so glad you are a fan of that phrase. I love the sound of it, too. Yes, you have me convinced, yearstricken… this type of research is very popular among statisticians as well. You just keep looking for support for your thesis, and ignore any of that negative feedback. Who needs it? Let’s be positive. Thank you for your support, ShimonZ. Facts that don’t align with our preconceived notions are, as you said, merely negative feedback. MAD, first and always. Practicing what I (& you) preach. Now you can put a Mad in front of your name and a MAD behind it. Who am I to argue with an expert? Far be it from me! I avoid arguing with myself as well. It doesn’t seem to help.